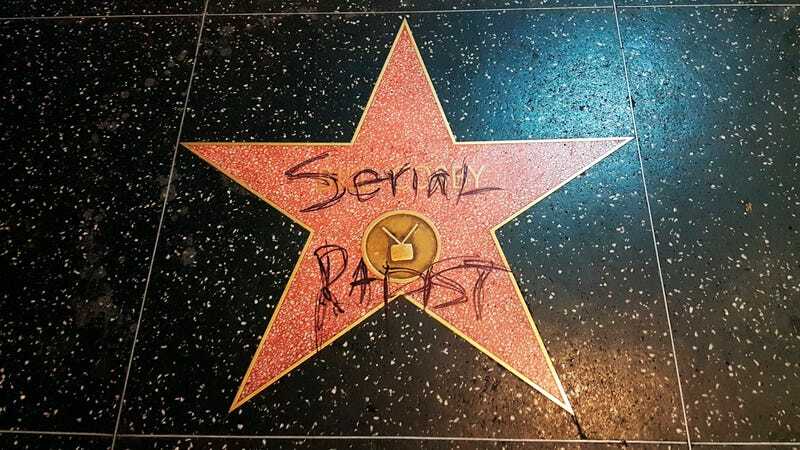 Bill Cosby’s star on the Hollywood Walk of Fame on Sept. 3. NORRISTOWN, Pennsylvania—Bill Cosby was sentenced to three to 10 years in state prison on Tuesday for the night in 2004 he drugged, then sexually assaulted Andrea Constand in his Cheltenham home. Cosby—once a comedian so successful that having one of the most popular sitcoms in TV history was just a part of his resúmé, considered so wholesome he was dubbed “America’s Dad”—was found guilty last year of three counts of aggravated indecent assault and earlier in the day ruled a sexually violent predator. Many more women have said they too, like Constand, were drugged and sexually assaulted while unconscious. But only Constand’s case still fell within a state’s statute of limitation and could have a criminal trial brought. The sentence was issued by Judge Steven T. O’Neill, who also oversaw the both criminal trials; the first ended in a mistrial, while the second ended in a conviction. The Commonwealth had asked for Cosby to be sentenced to five to 10 years in state prison. Cosby’s defense team asked for just house arrest, citing Cosby’s age and declining vision as factors. “The day has come, the time has come,” O’Neill said before reading his sentence aloud. The sentencing hearing began Monday morning, with prosecutors presenting a psychologist who said that Cosby should be sentenced as a sexually violent predator. Cosby’s legal defense team, his third collection of lawyers since the first trial, had an expert that they wanted to have testify to refute the findings, but their expert wasn’t available until Tuesday. O’Neill agreed to let that expert testify on Tuesday and he did, reiterating the defense stance that Cosby was too old to reoffend. O’Neill ultimately ruled Cosby was a sexually violent predator. On Monday, Montgomery County District Attorney Kevin Steele had Constand take the stand. After two rounds of testimony and cross examination, each time having to recall one of the worst nights of her life and then having defense lawyers paint her as a scorned lover, a whore, and a gold digger, this time was brief. Constand took the stand and spoke briefly, telling O’Neill, “All I am asking for is justice as the court sees fit. Thank you.” She did not read her victim-impact statement aloud, but Steele entered it into evidence. She was followed by her mother, Gianna, her father, Andrew, and her younger sister, Diana Parsons, who all read aloud their victim-impact statements, talking about the toll that the sexual assault as well as the legal process and the constant media hounding took on Andrea and their entire family. There was the media presence outside their house, so thick they couldn’t leave, and the smear campaign run against them. Cosby declined to speak at his sentencing hearing. Other than his legal team’s one expert, nobody else took the stand during sentencing on Cosby’s behalf.